I’ve s-l-o-w-l-y been redecorating my home office into a space that most reflects my current design style. I am very thankful and fortunate to have a room to call my own where I can blog, answer emails, make schedules, craft, write letters, and wrap gifts. I have enjoyed having this room to retreat to, but something felt “off” with the decor and it was never quite right, but it’s much better now. 🙂 I wanted to transform the office into a more sophisticated space and I think the black and white accomplishes that. I still have punchy pops of color, just in smaller doses. When we first moved into our home in 2010, I had a pale yellow, grey and white color scheme going on in my office, but I quickly grew tired of it. Painting the walls white (Diving White by Sherwin Williams) the same color as the trim and ceiling made the room feel fresh and clean. Then, I turned my Z Gallerie Jett desk to face the windows and really enjoy this view as I work. The room is on the second floor of our home, so I see beautiful trees and sky when I look outside. 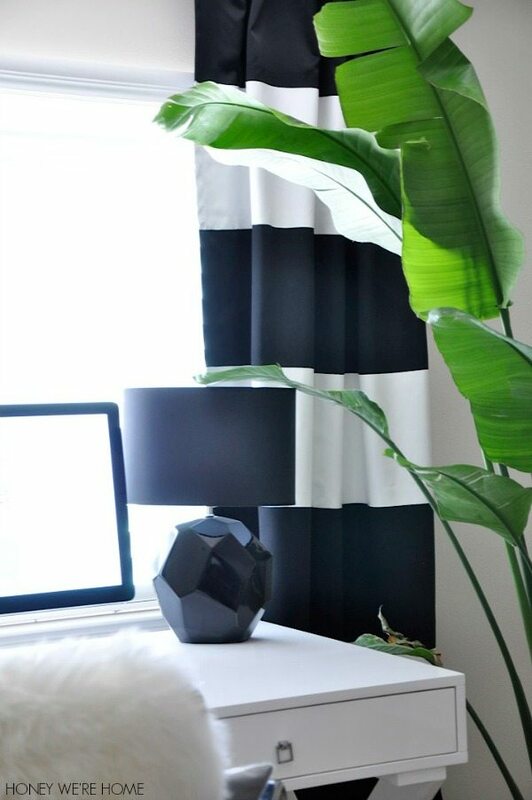 Bringing in this large, live plant and putting it in an Ikea woven basket made a huge difference in the look and feel of the room too. (You should’ve seen me bringing it home in my car- through the sunroof!) Having something living and green feels very natural and was just what the space needed. The Ikea Rens sheepskin rug thrown over my desk chair also brings in more texture. I tend to shop everywhere and this small desk lamp is from Wal-Mart (but I couldn’t find it on their website anymore- if you see it, please send me the link so I can share it). If I’m up in my office late, I prefer a dim light as opposed to the bright ceiling lights. I changed out the chandelier for a simple flush mount ceiling light. The horizontal striped black and white drapes were an almost-fail DIY project, but ended up being a nice focal point in the room. I just about gave up painting them because the white paint wasn’t adhering to the black polyester fabric, but after 4 coats, it finally worked! 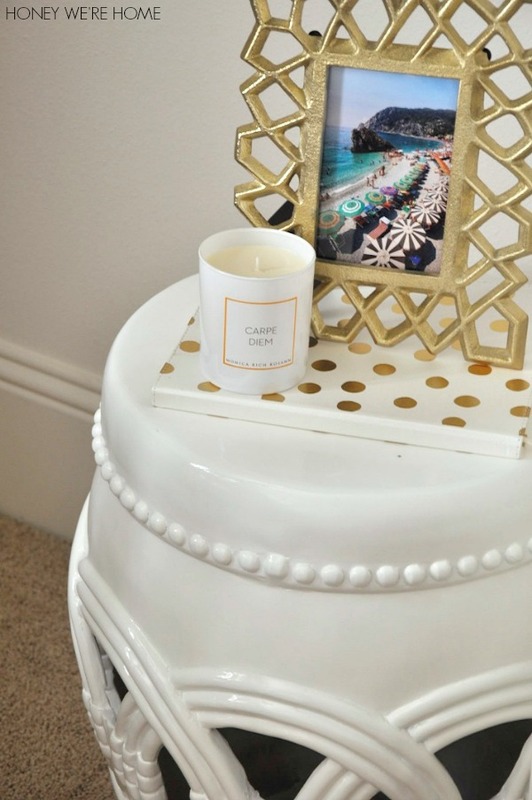 This Homegoods garden stool is currently styled with a Homegoods polka dot journal, Target frame, and candle, but I often have stacks of magazines on it for inspiration or relaxation. It took a long time to get the look of the Ikea Expedit bookshelves to a place of not too much going on, but still collected and interesting. I have mostly all books in there now and removed some of the art that was previously above the bookshelf. Those six decorative magazine holders are wrapped with Rifle Paper gift wrap and then I added bookplate labels. Adding a table for extra workspace (Ikea Docksta table) has been great. I craft and lay out project materials here and my son colors or draws. The table is sturdy, but I cover it with a tablecloth when my son is working so the top doesn’t get damaged. The rattan chair in the back is the Ikea Storsele. It’s mainly for looks because I’ve realized it isn’t very comfortable for long. 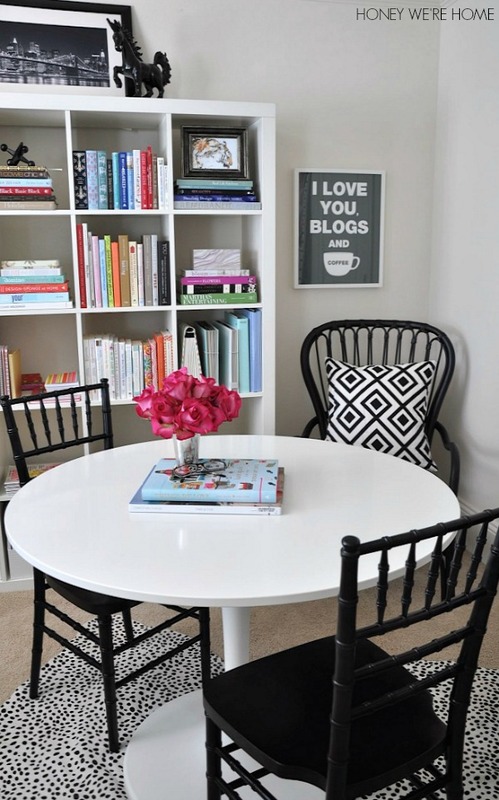 The “I Love You Blogs and Coffee” print is a cherished item that I purchased when I first started blogging over 4 years ago from Jen of Made By Girl. I debated over the style and color of the table chairs for awhile too, using temporary plastic folding chairs at first and ruling out these chairs as too much white. Finally, I opted for a pair of stackable ballroom chairs and they go perfectly with the black and white color palette. The website says they are out of stock now, but you can leave your email to be notified if they become available again. I did that with the chairs in our sitting room. I’m a big fan of layering rugs over carpet and I found this leopard print rug at Jersey Road, but don’t see it on their website any longer. 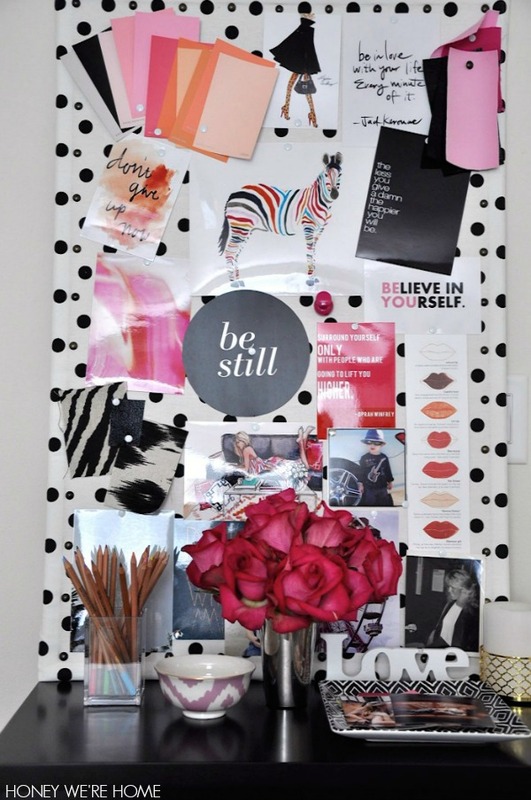 This mood board set the tone for my office and new blog design with black, white, pink and coral. I DIYed this by wrapping a cork board with polka dot fabric and added nailhead trim. 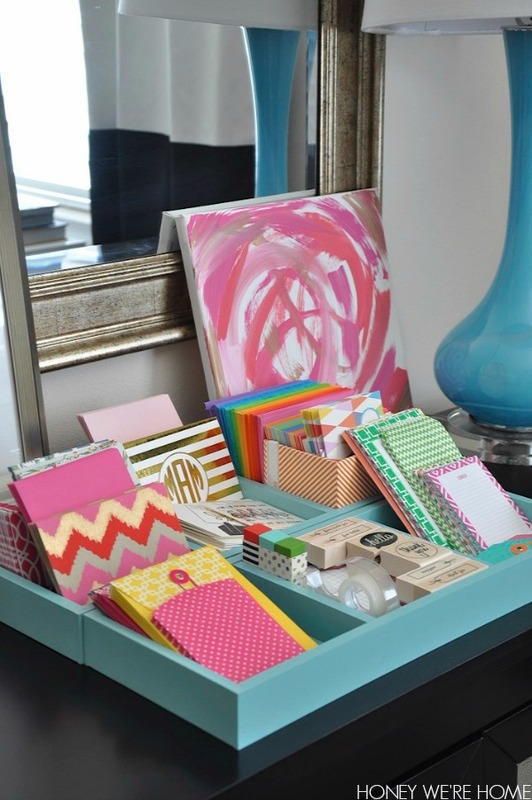 Although I moved my aqua wrapping carts to the closet because they were too candy-colored, I kept the top dividers out because I love having stationery and cardstock out for impromptu note writing and letter sending. I have found that I’m more apt to send a note when I keep my cards out. I have a nice supply of greeting cards that I switch out from time to time. My other supplies are kept in my tall chest of drawers or desk drawers. 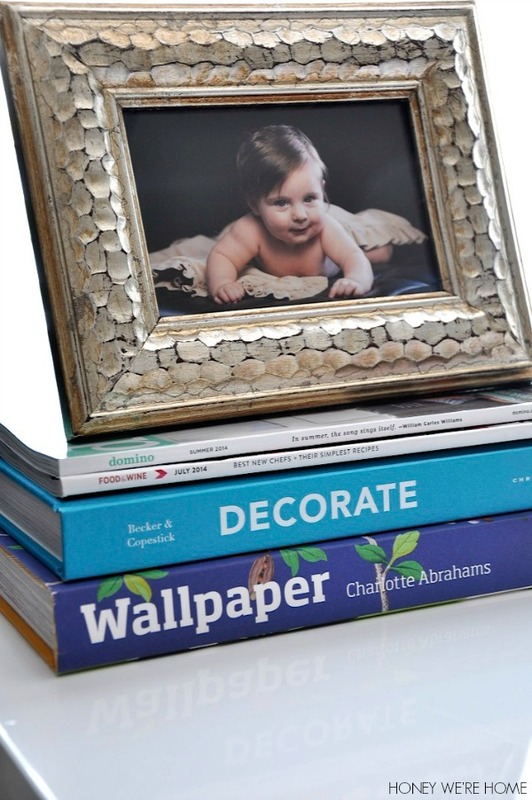 And I love to keep one of my favorite framed photos of my son (he’s 2 months here) on my desk. Sweet boy! 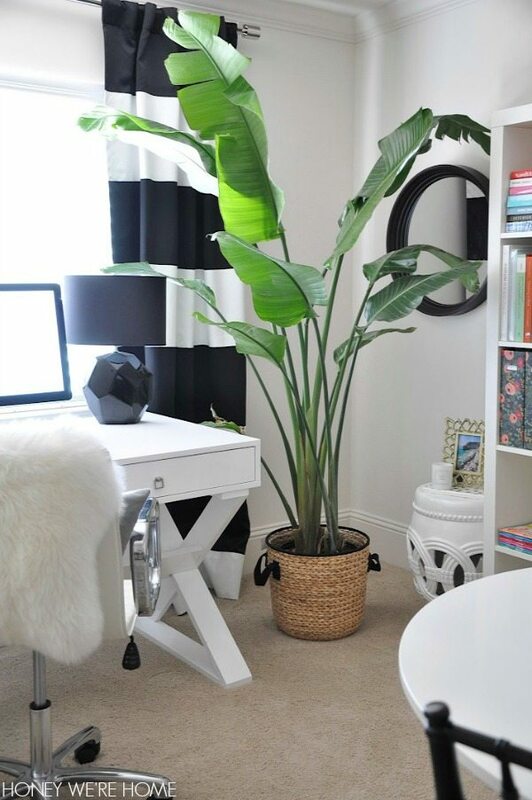 What a beautiful workspace, Megan! I'm sure you enjoy spending lots of time in there. Love the color scheme! Yay!! 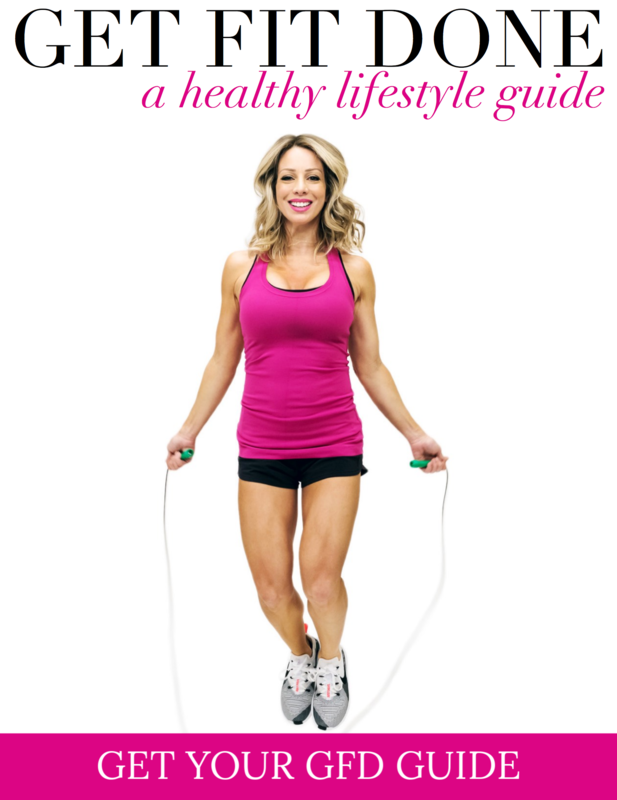 It was so worth the time it took to get everything to come together, it's so stylish! 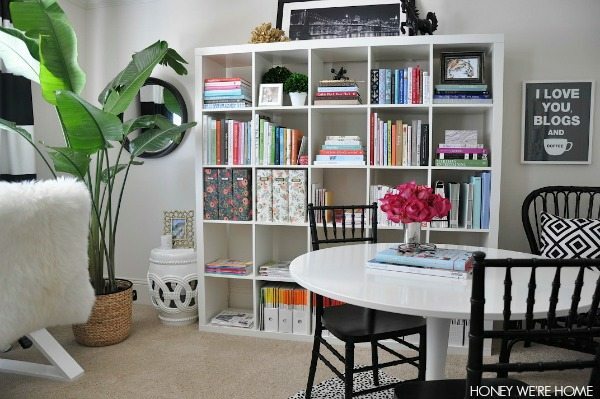 Your Expedit looks great, those are hard to style, and I love the dramatic black and white stripes! I'd still like to get woven baskets for the bottom row of the Expedit- I think it will add more texture and warmth. I wasn't crazy about the ones at Ikea, but haven't found anything else reasonably priced I like better. The table is a great knock off of the high end version. Great space Megan. I have a lot of the same staple pieces in my downstairs office. Now that the girls are gone, I am fortunate enough to have a separate space upstairs for crafting. I need to edit my bookshelves as well. Yes, having a table and a desk helps so much! The room looks beautiful, Megan! I really loved your first office with the yellow walls and was sorry when you started changing it. I didn't think that I'd like the black and white as much but I love it now with all of the finishing touches. Love the table and chairs and the great plant. Enjoy it. I love it! So beautiful. 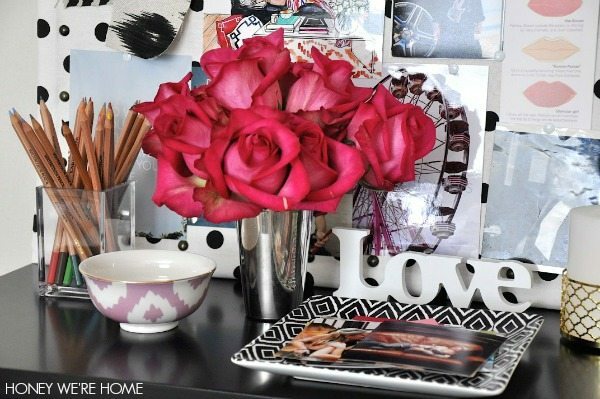 You did an amazing job styling it and your color scheme is perfect! Thanks Rebecca! I'm glad you like it! Squeal! This is soooooooooo good, Megan. 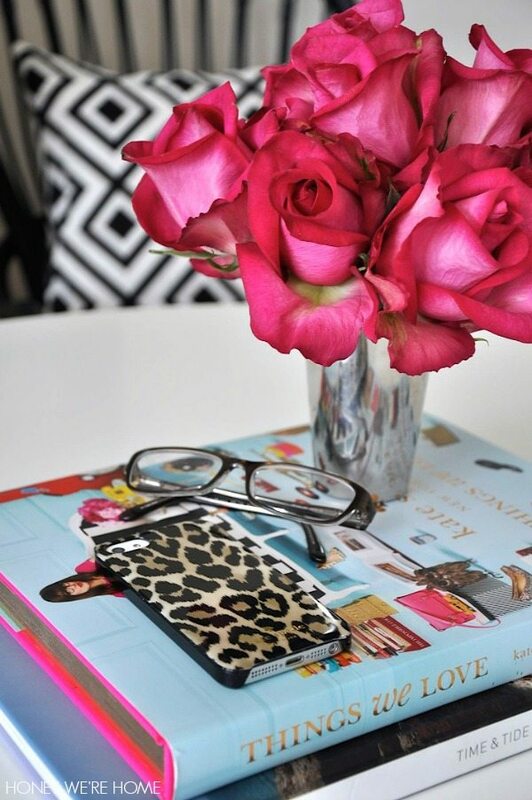 I LOVE the spotted rug and the pops of pink. Those chairs are such a great find and contrast with the table. 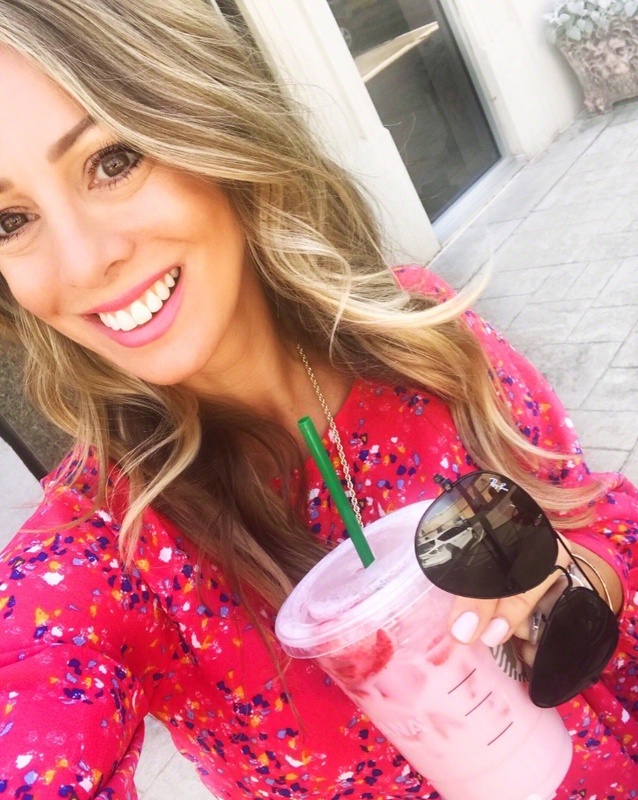 Wish we could blog plan in there together over coffee! Me too! Just sent the white chairs back, these black ones were a steal! Any chance you might be interested in selling the curtains you had in there originally? Thanks! Sure! Maybe just for the price of the fabric- they are home sewn by me and I'm no expert! I hung them with ring clips. 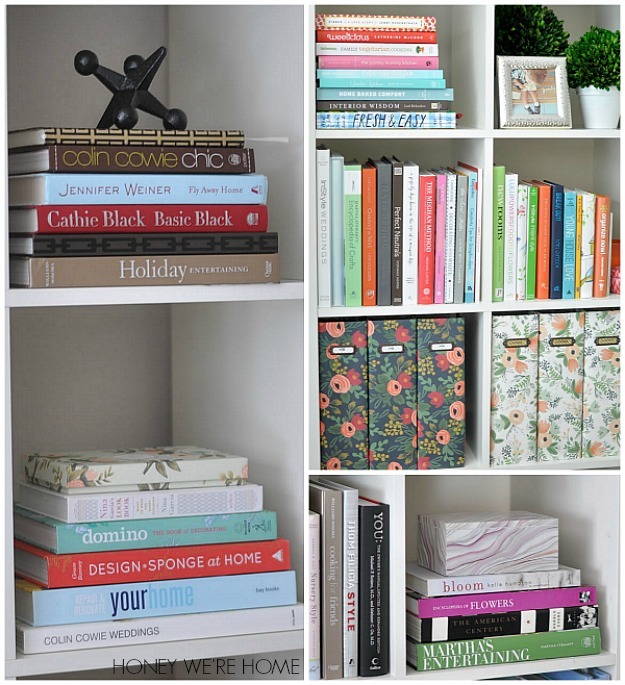 I could come over and help you organize- one of my favorite things to do! Thanks for the sweet compliment! Love it! 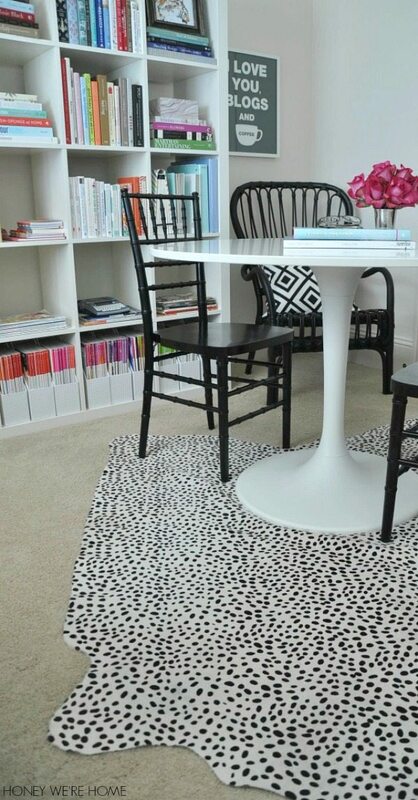 I love the spotted rug and those chairs! That plant is awesome! I've been looking for a big one like that for our living room. I think I'll have to check out Lowes soon. A big plant makes a world of difference. I'm trying to take care of it so it stays healthy! Great office space Megan! And I love that you have hung on to all your O magazines. I was debating over the weekend if I was going to get rid of mine but have decided to keep them. Your office space is inspiring. Thanks for sharing. I know! I've been a subscriber since Day 1 and they've meant so much to me! Some of them are cut up for collages, but I still keep them. I love everything about it. It looks so fresh and relaxing. Can you tell me where the multicolored zebra is from that's on your mood board. I die over that. Thanks!!! Oh yeah, love that fabric. It's a swatch from High Fashion Home, but I'm not sure the name/brand. Love love love this space!! My house is always evolving too! It's the curse of décor ADD. I'm already in the process of changing Lola's room again (she just turned one!). You inspire me to get off my rear and get it done though, as I sit here staring at windows with no curtains! 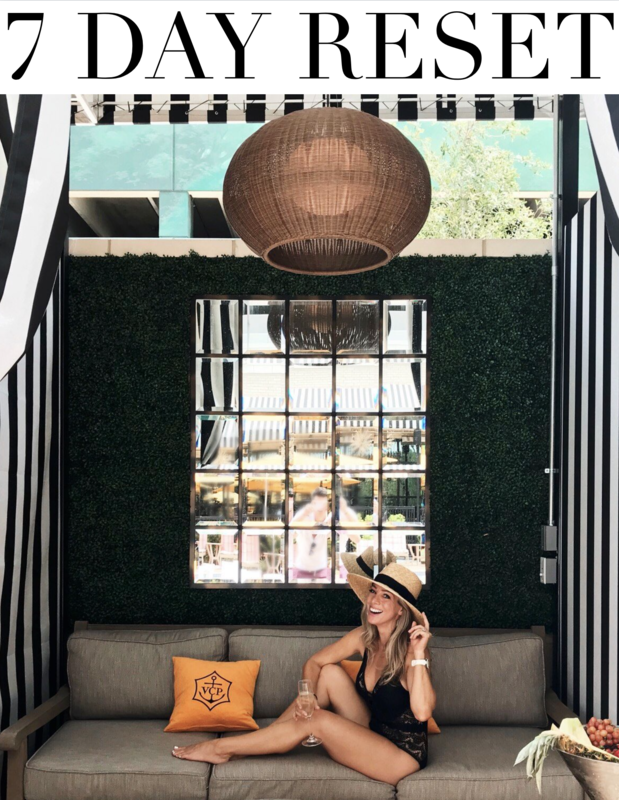 What a gorgeous space Megan! I would love to work in here each day. Can't we have work dates? hehe Wish I lived closer so I could see it in person. Hope I get to see your lovely face in two weeks! 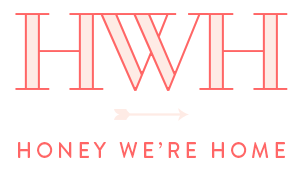 You are going to Haven this year…right? Beautiful! I want to get that plant and basket for our dining room. So pretty! I spied a few items that I have too. Love the black chairs against the white table. I would never leave the room if that were my home office! I love your office! Can you tell me what kind of plant that is? Thanks Robin- the plant is a white bird of paradise. I love your office!!! Where was your office chair purchased? Thank you! The chair is from Crate & Barrel. Can you tell me where you purchased your desk chair? I've been looking for one just like it — is it comfortable? Thanks! The chair is from Crate & Barrel- yes, comfy!